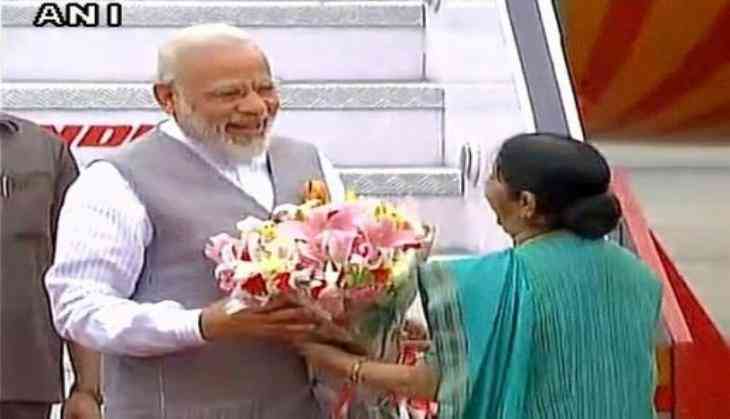 Prime Minister Narendra Modi arrived in the national capital on Wednesday morning following a successful three-nation tour which culminated at The Hague on Tuesday. The Prime Minister was received at the airport by External Affairs Minister Sushma Swaraj. Prime Minister Modi first visited Portugal, where he, along with his Portuguese counterpart Antonio Costa, signed 11 MoUs for cooperation in areas including double taxation avoidance, investments, science and technology, nanotechnology, space research, administrative reforms and culture. Speaking at a joint conference after holding a bilateral discussion, Prime Minister Modi said the two sides have also agreed to set up a joint science and technology fund of four million euros. He also announced setting up of a Chair for Indian Studies in University of Lisbon and developing a Hindi-Portuguese dictionary for mutual benefit. The two leaders also launched a unique startup Portal - the India-Portugal International StartUp Hub ( IPISH) - aimed at providing information on start-up hotspots in the two countries and associated policies. The platform initiated by Startup India and supported by Commerce and Industry Ministry and Startup Portugal to create a mutually supportive entrepreneurial partnership. Following his Portugal visit, Prime Minister Modi headed towards Washington for his first face-to-face meeting with U.S. President Donald Trump. President Trump and Prime Minister Modi pledged to increase economic cooperation to make their nations stronger and their citizens more prosperous. The Indo-U.S. Joint Statement asked Pakistan to not let its territory be used to launch terror attacks. Prime Minister Modi also met and interacted with 20 top American CEOs at a roundtable meeting in Washington D.C., and talked about various topics ranging from the Goods and Services Tax (GST), technology, India's economy and Digital India, Make in India, Skill Development, Demonetisation and the thrust towards renewable energy among others. In the final leg of his three-nation tour, Prime Minister Modi visited the Netherlands on Tuesday, where he, along with his Dutch counterpart Mark Rutte delivered a joint statement vowing to combat terrorism. "The fight against terrorism should not only seek to disrupt and bring to justice terrorists, terror organisations and networks, but should also identify, hold accountable and take strong measures against all those who encourage, support and finance terrorism, provide sanctuary to terrorists and terror groups, and falsely extol their virtues," they said.